Maintaining the GEN lamp is critical in keeping your BMW Airhead's battery charging. In the rare instances should a GEN warning bulb fail, that little bulb's filament will knock out the exciter circuit of the Airhead charging circuit. Bad bulb. No charge. 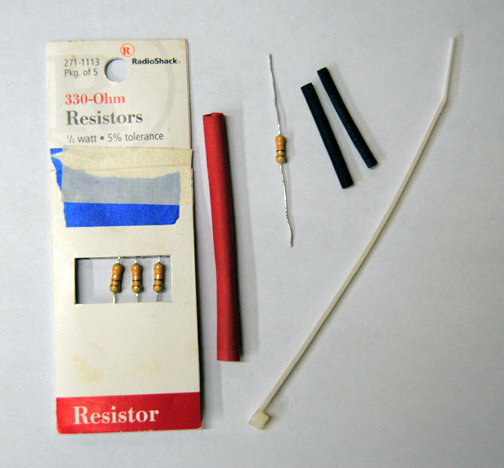 Available at Radio Shack, pick up a five-pack of 330 Ohm, 1/2 watt resistors for just over a buck. A bit of wire, shrink tubing and a zip tie completes the shopping list. Solder a wire to each end of the resistor leads. I used about one foot each of blue and green/blue as this is the color of the bike's wires you'll tap into. 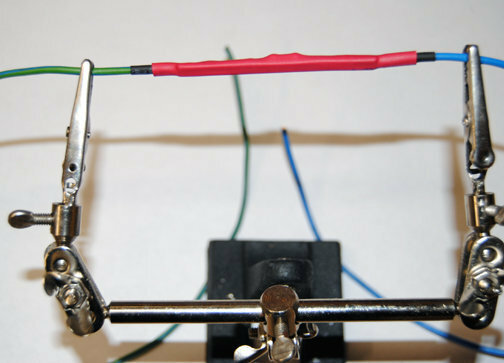 Use a heat sink clip on the resistor leads to protect the resistor from overheating. 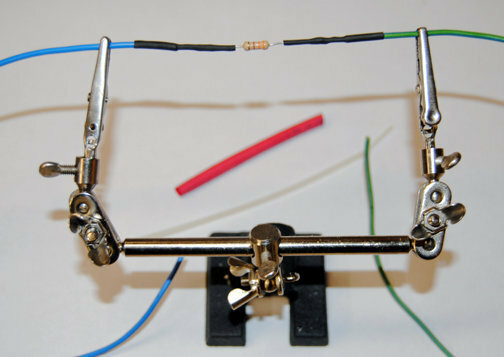 Cover the soldered joints with small diameter shrink tubing. Finally, trim down the zip tie and insert it into the larger diameter shrink tubing. The zip tie stiffener will prevent any potentially damaging flexing of the resistor leads. The install is quite simple: The green/blue wire attaches to the green/blue wire terminal on the ignition coil. Attach the blue wire to the blue wire found in that big, white nylon connector block under the fuel tank. That's it. I always feel better if I detach the negative battery cable when ever I'm doing any kind of wiring chores on my Airheads. This circuit is suitable for 1977-95 model Airhead BMWs. I fitted an Acewell speedo and a small LED for a GEN light. The LED didn't have enough resistance so I added this mod and have not missed a lick. It has been in place for 4 years now and working perfectly. I did add it to my printed copy of the wiring diagram so I wouldn't forget it is there. Hi again - hopefully the final question - I just wanted to check about the blue wire connection. I don't want to be messing with the 2 wire white connector under the tank - so I plan to connect to the blue wire on the back of the diode board. The surprise for me - was the connection of the resistor. I'm not an electrician but as the gen lamp is connected to the ignition lock (green/black? wire) and the blue wire from the old rev counter plug (I used electrical pins to connect the Acewell to this plug) - I had assumed that the resistor should be connected the same. I trust that this connection for the resistor must work - but could you explain why it has a different connection to the gen lamp.